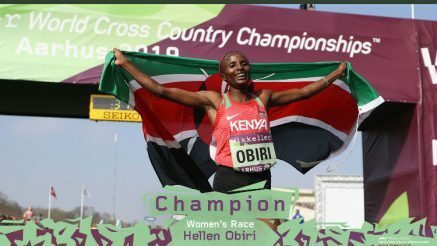 30th March 2019 – It was a memorable day for Hellen Obiri (KEN) as she not only made her World Cross Country Championships debut, she also won the title! On a course that was widely regarded as one of the toughest ever (if not THE toughest) Hellen demonstrated every trait necessary to be crowned a cross-country champion. Strong on the steep uphills, ability to stride out on the downhills, balance on the cambered terrain, bravery to run from the front, and ultimately speed at the finish. Hellen was crowned champion by crossing the line in 36:14 for 10km course, two seconds clear of the runner-up. In the moment she broke the tape Hellen also wrote her name into the record books. She became the first female athlete ever to win a world title indoors, outdoors and on the country. In the men’s race Thomas Ayeko (UGA) once more gave a very good account of himself. A former silver medallist in the junior race, here he finished in seventh position for his best ever senior placing. His run also helped the Ugandan team win the title. On the roads in Spain, Timothy Toroitich (UGA) and Emmanuel Bett (KEN) placed fourth and fifth respectively at the Azkoitia-Azpeita Half Marathon. Timothy clocked 61:06 closely followed by Emmanuel in 61:16. With the cross-country season coming to a close it must mean the track season is not far away and serval PACE athletes opened up by running in relay events in Austin, Texas. Jenna Prandini (USA) ran the second leg as her 4x100m team won their heat, before running a leg of the 4x400m too and clocking an eye opening 50.9 split. Shamier Little (USA) ran the second leg for her victorious 4x400m team with a split of 50.8. Bralon Taplin (GRN) also showed good early form with a 44.4 split.